Looking at this you might think that I have enough hats already. But in fact I have three reasons why twelve is not enough and need another one. I need it right now, actually, and can’t wait. There is no blue one. I love all the colors but they don’t all love me back. Like most women I’m careful to wear colors that flatter, especially around my face. Blue flatters me. Its a color that distracts from all the yellow I’ve got going on. Reason #1 to cast on for a new hat when I already have twelve of them: I have no blue hats. I’m cold-natured. I’ve whined about that before. Winter is tough on me. You would think summer would be better but sadly no. When summer comes along and everyone in Texas goes nuts with the air conditioning. People who crank the heat up to 75 degrees in the winter will crank the AC down to 70 in the summer. I’m telling ya, indoors its colder in the summer than in the winter. Which is why I carry jackets around all summer long. The only people in my life that don’t tease me about this is my mom (who carries her own jackets around all summer) and all my compadres at craft night. They take pity on me and sit outside sometimes. If a shawl gets finished off at craft night, they hand it to me to wear for the rest of the evening. Umm…. because I wasn’t bright enough to think of that on my own. That’s why. 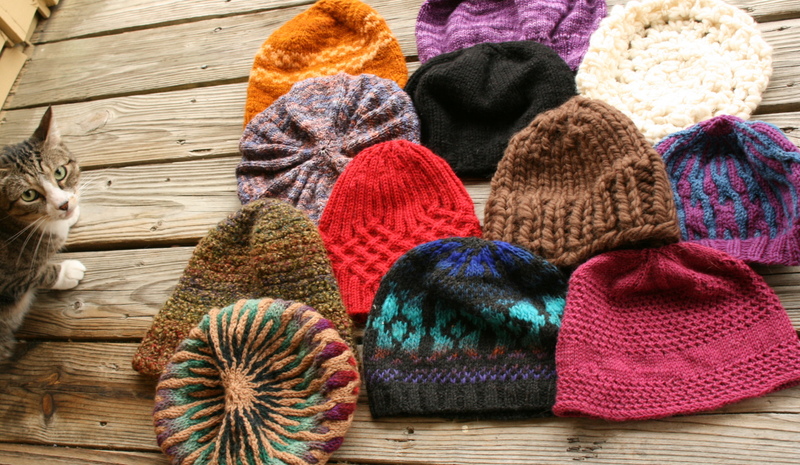 Reason #2 to cast on for a new hat when I already have twelve of them: They are easier to haul around than jackets. That was a challenge. You can see that right? She threw that gauntlet down right at my feet. Reason #3 to cast on for a new hat when I already have twelve of them: Impress Jess with a super-duper slouchy hat. So here is the blue, smaller than a jacket, and hopefully very slouchy hat. Future hat I should say. I had to rip out and restart a few times because that’s my very sophisticated design process. Its a sophisticated process that slows me down but its seems to be the only way I know how to design stuff. The hat should be done by the next craft night. I’m hoping to show it off and perhaps Julia will not think I’m a simpleton and Jess will think I’m awesome. 12 Comments on "On Being a Maker of Hats"
As I was looking at your hats, the one in the middle, bottom row, jumped out at me! Why does she have MY hat, I thought. Okay…she simply used the same yarn you did…didn’t she? so, do you recall the name/color of the yarn you used for that particular hat? I have one that looks so much like it; I used Knit Picks Chroma 1) solid in a brown shade; and 2) a hand-painted colorway. I made mine with Noro Kureyon (no idea what color) and Cascade 220 Jet. I’m glad you like it. Doing a fair isle pattern in a color changing yarn is one of those things that guarantees success I think. Can’t wait to see the Slouchy Enough Hat! I did get it done. I still have to get pictures taken, though. If there are no pictures it doesn’t count, right? RIGHT! Ohmygod. What is the pattern for the bottom right hat in the picture! I adore making hats. It’s a wonderful way to experiment with different colors, techniques, etc etc. I would love to knit that hat! The bottom right? the pink one? Oh shoot. That’s one of those patterns I wrote up before I started blogging and haven’t gotten around to publishing yet. I soooo behind in getting my patterns tested and published. I make up hat patterns, too. Make them up as I go along. Some have been appreciated by other knitters, but I’m terrible about writing them down. Even a very simple one I made up I can’t get written down – flummoxed at how to write how how I hemmed the brim. Anyway, would love to fool with that bottom LEFT hat! 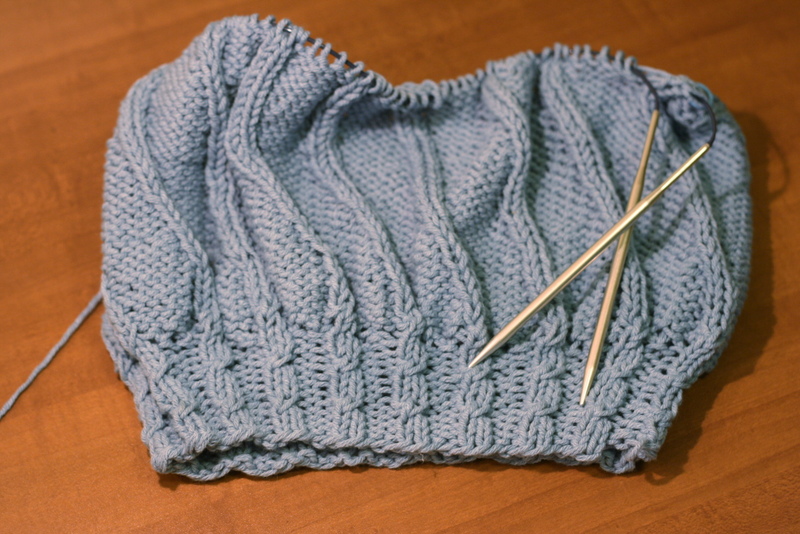 I’d be a test knitter — AFTER the wedding presents are knitted (after mid-july).